TV3 today launched its new-look three channel group strategy at a special event at The Cliff Townhouse on St. Stephen’s Green. 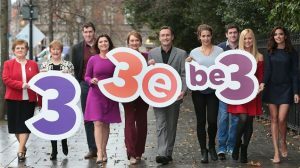 While its current channels TV3 and 3e will receive new brand identities, a third channel, ‘be3’, will launch on 9th January, replacing UTV Ireland. TV3 will be the group’s flagship channel, focusing on premium Irish content and the best of acquired programming. TV3 will see yet another step up in prime time originated content including Red Rock, Gogglebox Ireland, Celebrity Masterchef, and The Restaurant. Coronation Street and Emmerdale join internationally acclaimed drama such as Broadchurch and live premium sport including the best Tuesday night UEFA Champions’ League matches. TV3’s growing commitment to current affairs will continue to be at the heart of the schedule with Pat Kenny Tonight, Agenda presented by David McWilliamsand Tonight With Vincent Browne. Starting this January, 3e will be the exclusive home to the ratings winning Big Brother and Celebrity Big Brother franchise. 3e, as the entertainment channel for 15-44s, will also be the exclusive broadcaster of the Xtra Factor, Get Me Out of Here Now, Britain’s Got More Talent and all the biggest after-show party programmes, along with Graham Norton and Jonathan Ross and the home of UFC. be3 will be home to drama and chat and give viewers a second chance to see their favourite soaps. be3 will be home to popular programmes such as Midsomer Murders, Loose Women and Benidorm. 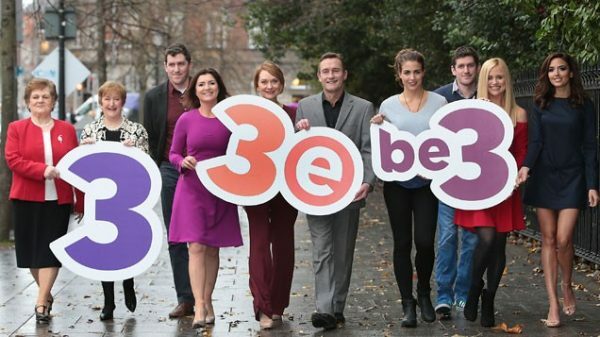 be3’s programming schedule will complement and enhance the TV3 and 3e output and will keep its audience up to date with national and international news with two half hour news bulletins every weekday evening. ‘3Kids’, TV3 Group’s daily three hour children’s programming block also moves to be3 from Monday 9th January. News across all three channels will be provided by ‘3 News Ireland’. This newly branded TV3 Group centralised news hub will provide individual news programmes for all three channels. ‘3 News Ireland’ launches on 9th January. At the event to mark the occasion was a number of the group’s key talent including Pat Kenny and Colette Fitzpatrick, presenter Karen Koster, economist and business presenter David McWilliams as well as well-known faces from some of TV3’s most popular programmes; Red Rock, Gogglebox Ireland and Emmerdale. TV3’s new look three channel offering will come into effect from Monday 9th January, 2017.